Kinetrol spring return actuator on cement silo valve. A silo is a structure for storing bulk materials. The cement silo is an integral piece of equipment for any concrete production operation as it allows the product to be stored, purchased and distributed in bulk. 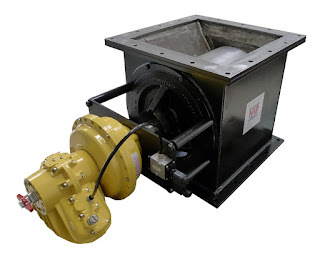 Fitted beneath silos, various types of butterfly or other rotary valves are used to control the flow of cement into trucks or other transport devices. One particular cement processing plant needed a replacement for their main silo off loading valves. These valves fill cement trucks the company used to deliver their product. The plant's existing valves were poorly applied for this use and were causing major headaches. The valves were designed with thin steel plate, large gaps between the valve body and disc, and rubber seals that wore away, leading to cement leaking through the valve. The leaking cement would spill onto a feed trough where it would cake and require manual cleaning - an expensive and time consuming operation. If the valve didn’t leak, this expense and time would be saved. A custom valve manufacturer was called in to use their engineering and fabrication expertise to develop a custom valve that would last. The result was a new rotary valve that uses a much hardier wear plate, and the rotor and body are carefully machined with only a 2/100ths of an inch gap between them. Additionally, the design provides a mechanism to catch any cement should any ever make it through the gap. The new, custom designed valve needed an actuator that would be equally reliable. The selection of Kinetrol vane actuator with a spring return was the most obvious because its power and its reliability. With only one moving part and no complex linkage to wear out, it was the best choice for long life. The combination of valve and actuator is expected to last many thousands of operations with no maintenance.